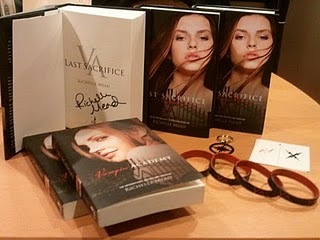 Last Thursday night was Richelle Mead's book signing, for the Last Sacrifice book tour here in Seattle - and as promised, I have a few goodies to give away to a few of my lucky followers! It was great to meet Richelle - she was really down to Earth and I particularly enjoyed how she spent time talking with everyone...especially all of her teen fans (and there were many!). Her husband was even there, taking pictures to post on her blog - and I sat next to him for about fifteen minutes, while I waited to take a picture of my lurv-e-ly friend, Boom! 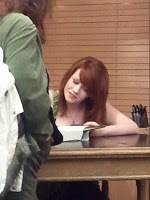 Bridgid (she'll laugh at that, I know), when she got up to meet Richelle. It was great to hear his thoughts on all the VA madness - and I had to confess to him, I took a picture of him while he was sitting off to the side, reading emails on his phone. Said picture was subsequently texted to my husband with the caption, "Look honey! 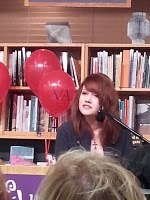 When I get published, this is what you get to do!" Needless to say, Mr. Mead thought that was ha-larious! 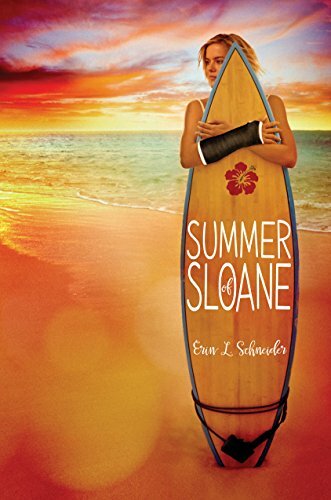 Anyhow - on to the fun and all the details of the book(s) giveaway! 1. Eligibility. Giveaway is open to followers with a valid shipping address (sorry, no P.O. Boxes, please). Yes, that means this is open to international followers, as well! Please tally up all of your entries, leave a comment below with your total - and a valid email address so I can reach you if you win! 3. How Can I Win? A number will be assigned to each of your entries - so say you have a total of 6 entires, you'll get 6 random numbers assigned to your name. Winning numbers (did you catch that? Yes, there's more than one prize!) will be selected via Random.org next Friday, 12.24.10. 4. The Dreadful Deadline. Contest is open from today, 12.17.10 to next Thursday, 12.23.10 - and a winner will be selected on 12.24.10 (Merry Christmas!). All entries (aka comments) for this contest need to be received before 11:59pm PST on Thursday, 12.23 to be eligible. 5. Winner, Winner, Chicken Dinner! I will post the names of all lucky winners on Friday, 12.24.10, so check back to see if you've won (I'll email the winners, as well)! 6. The Goods. Wanna see what's up for grabs? Yep, books, books, and books - plus a few swag pieces, as well! Good luck, everyone! And Happy Holidays, too! Disclaimer. A Little of This & That Blog will not be responsible for: (a) any late or lost entries; (b) telephone, electronic, hardware, software, network, Internet, or other computer or communications-related malfunctions or failures; any giveaway disruptions, injuries, losses or damages caused by events beyond the control of A Little of This & That Blog or by unauthorized human intervention; or (c) any printing or typographical errors in any materials associated with the giveaway.